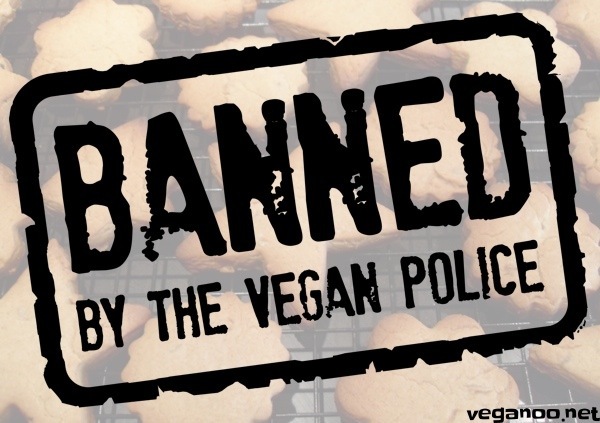 VEGANOO Vegan Reviews: Banned by the Vegan Police. How Vegan is Vegan? Banned by the Vegan Police. How Vegan is Vegan? If the fabric on your restaurant chair is made of wool, is your meal still vegan? Undoubtedly. How about if the conveyor belt in a biscuit factory contains wool fibres, are the biscuits still vegan? We say yes, and here's why..
First, let us clarify that this is a genuine question. Last week we published a review of Fox's Munch biscuits before we'd heard back from the manufacturer about their production. The response came in this morning and stated categorically that no Fox's product is suitable for vegans because of the production methods. Fox's confirmed that the recipe contained no animal products, but pointed out that the production line was shared with biscuits that did. They also added that their conveyor belts contained wool fibres and that their pastry brushes were bristle. Now, they've obviously done their homework or more likely The Vegan Police have got to them before we did. It's quite clear that their response to us was pre-prepared as if they've been questioned before in exacting detail about their production environment. Most non-vegans wouldn't even be looking for wool fibres in conveyor belt materials, nor would most vegans. We've got bigger battles to fight. The Vegan Police give vegans a bad name. Sure, it's healthy to have these kind of checks if the manufacturer wants Vegan Certification, but this pedantry is going too far for those that don't seek it. Nothing on Earth is 100 percent vegan. The wheat flour in the biscuits contains insect fragments at much higher concentrations than the occasional wool fibre from the production line. It's impossible to avoid vanishingly small traces of animal contact with our food and why should we? Veganism is not an allergy, or a religion, but a compassionate lifestyle. It's the big picture that counts. We'd be quite happy for Fox's to add 'Suitable for Vegans' on their Munch biscuits and our review will stand, although we'll add the manufacturer's comments to the post...for the pedants. Having gone vegan recently (a month ago, before that I was veggie for many years) I have found that it is easy enough to eat & be vegan, as long as I don't worry about foods with 'may contain' disclaimers - or 'not suitable for milk allergy sufferers due to the methods used in manufacturing...' blah blah blah. I think most vegan prodcts contain those disclaimers now just to cover themselves. I'd happily eat something that 'may contain milk' as I live in a house with three non-vegans, so cross contamination could occur in my own home.